It’s hard to believe that this album was recorded last year, as the sound, and even the style, is much more settled in the early 90’s than nothing else… C.J. Snare from FIREHOUSE has mixed and mastered that CD… Maybe it’s the reason… But don’t get me wrong, this Vintage flavour isn’t a bad point as, I'm a nostalgic s.o.b. quarantine Metal Maniac! 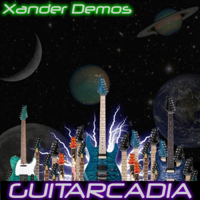 You can enjoy some great lead-guitar here, and even some good motherf***n’ shreddin’… Because Xander can surely play… He can play even quite fast… But the song structures are very integrated and the melodic-themes are always the essential center part of those. Only “Woodshed Sonata” is an exception to that rule as it’s a self-indulgent but jubilant ad-lib Shredding cut. Xander seems to be a very open-minded and a cool guy, so don’t hesitate to order directly to him this record. He is lately playing with 'US METAL legend' Bill Lionel aka James Rivera’s tribute band SABBATH JUDAS SABBATH… Another cool band for Hell Rats people like me!